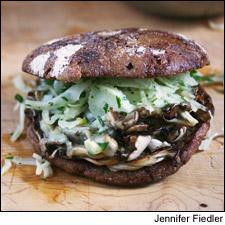 Thinly sliced fennel takes the place of lettuce and tomato on this easy mushroom burger. Going by natural selection alone, portobellos are the obvious mushroom for burgers: Their round and patty-like shape are nature-made for buns. But there’s a whole kingdom of mushrooms that are totally burger-worthy too. Maitake mushrooms (also known as hen of the wood) make a particularly good option. They’re firm, juicy and roast well; the petal-like fronds get browned and crisp while the trunks stay tender. In this recipe, sautéed maitakes are topped with melted fontina cheese and thinly sliced fennel for a quick and easy summer meal. If you can, buy maitakes that are still somewhat clumped together to better approximate a burger shape, but if your grocer has already separated them into tinier pieces, no worries—melted cheese will help keep everything together. This meal is particularly easy on the wine-pairing front. Think earthy lighter reds that will pair with the mushrooms and the anise flavors in the fennel. A Cabernet Franc from the Loire had the right herbal notes for the fennel, and the acidity in a Nebbiolo from northern Italy made a great contrast to the texture of the mushrooms. But we best liked a medium-bodied Barbera from northern Italy. The earthy, vegetal notes in the wine locked with the toasted rye buns and crisped mushrooms, erasing the bitter finish and letting the cherry flavor shine. 1. In a medium-size bowl, toss the sliced fennel and minced parsley with the lemon juice and 2 tablespoons of olive oil. Season with salt and reserve. 2. Brush the inside of the buns or English muffins with olive oil and toast them either in a toaster or on the stove top. 3. In a large sauté pan, heat 2 tablespoons of cooking oil over medium-high heat then add the mushrooms and cook until the mushrooms have softened, stirring or flipping over the mushrooms as needed. Adjust the seasoning with salt. Turn the heat to low and divide the mushrooms into four rounded “patties” in the pan and cover the patties with the sliced cheese. Cover the pan and cook until the cheese has melted. 4. To assemble the burgers, use a spatula to lift the cheese covered mushroom patties onto a bun. Top with the sliced fennel mixture and serve immediately. Serves 4.